Our story starts in the end of the 16th century. Cotton fabrics from India, with lively colors, arrive in the harbor of Marseille. These cotton fabrics strike the merchants with their incredible dyeing: every cleaning seemed to make the colors brighter. These indiennes were assigned to the national and international export. In 1648, while there was a shortage on Indian fabrics, the first indienne workshop opened in Marseille. It seems that a playcard maker, Benoit Ganteaume, had the idea of associating with a wood engraver, Jacques Baville, in order to print raw cotton fabrics from the Middle- East. In the beginning, the quality was mediocre, the Provence indiennes were only one-tone or two-tone, and were not likely when washed. The first factories counted on the profitability; because it was made in France, it would be less expensive than real Indian fabrics. These Provence cotton fabrics were mainly worn by the lower class people because they could not afford the real and beautiful imported indiennes. Also, the first indiennes makers where playcard makers for whom fabrics were just an extra job. 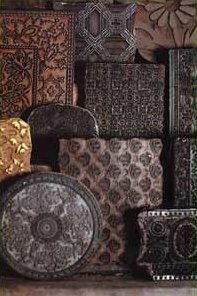 The desire for these fabrics increased after the creation by Colbert of the East India Company in 1664. The rich bourgeois snatched these fabrics from each others hands, and Madame de Sévigné launched the fashion in the court of Louis XIV. In 1669, Colbert suppressed the taxes in the harbor of Marseille which gave easier access to import. The local indiennes makers understood that in order to keep their clients they had to improve the quality. As soon as 1672 with the help of Colbert they brought into Marseille a group of Armenian traders and technicians, whose skill had been famous for many centuries. After the transfer of technological skill, the professions of indienne maker and playcard maker separated. Marseille had a well-known skill that was quickly copied in Avignon, Arles and Nimes. These painted or printed fabrics competed with that of the traditional wool and silk fabrics. The complaints of wool and silk craftsmen increased after 1681, because several silk factories in Lyon had to close. The death of Colbert in 1683 changed everything. First, the Marseillans who wanted to get rid of every local competition fired the Armenians from the town. The situation became more complicated after the revocation of the Edit de Nantes, which protected the Protestants. The result was that many qualified craftsmen and a lot of money left the country. In order to fight against the economical crisis, minister Louvois convinced king Louis XIV to make a law that prohibited the Indian painted fabrics and the French imitations, in 1686. His goal was to stop the fashion of Indian fabrics and protect the French traditional fabric makers. That prohibition ended in 1759, 74 years later ! That law prohibited not only the manufacturing, but also the trade and use of printed indiennes. The taste for these fabrics never stopped though, and many were smuggled into the country. Marseille tried to resist against that law, but in 1689 all the printing blocks in Marseille were officially broken on a public square. Many indiennes makers then moved to Avignon. It was a papal city where the prohibition wasn’t applied. Tuscany was also a welcoming area. In 1703, the king understood the economical problems that his law caused . He soon announced that Marseille could produce, and use indiennes as well as sell them to other countries. However, the indiennes were still forbidden in the French kingdom, and the repression became stronger. For example, in 1726 a law sentenced the smugglers to 3 years as galley slaves, and the smugglers who carried weapons would be sentenced to death. In 1730 Aix en Provence was the capital city of smuggling. The fabrics that came secretly from Marseille were stored in the houses of nobles. Since the police couldn’t arrest the nobles, the repression was only against the poors , who couldn’t pay the penalties.That’s why there was a terrible riot in Aix on the 18th October 1736. After that, it was almost impossible to apply the law, and as soon as 1750 clandestine factories were created. The Marseillan indiennes reached its zenith in 1754; there were almost fifteen factories in town. However the Seven Years War caused a deep economical crisis, and the minister Trudaine decided to re-open the national trade. The prohibition ended in 1759. Unfortunately, the fiscal system and high wages caused a relocation of the Marseillan factories into Provence; this caused the development of indiennes making through the entire country. The secret of the famous factories was the endless invention of new decorative patterns. The indiennes were in fashion again and were most popular in the 1790’s. In the beginning of the 19th century, the decline of the Beaucaire fair and the competition of English and alsacian factories caused a progressive disappearance until there was only one indienne factory in the 20th century, Souleiado, in Tarascon. In 1806, Jean Jourdan created in the former convent of the Capucines located in the center of Tarascon, a factory on Indian-like fabrics called Manufacture Jourdan. In 1821, he sold the convent to the town in attempt to solve his financial problems (the town turned it into a theater which still exists today). Jourdan moved his factory into the Aiminy mansion, and also, founded handkerchiefs factory in St Etienne du Grès. His son Matthieu succeeded in 1840 and managed the factory until he died in 1882. In 1882 the factory was managed by one of the last indiennes merchant, Paul Véran, who wanted to preserve a production site when so many factories had closed, one after the otheras well as when the people of Provence gave up their traditional outfit. 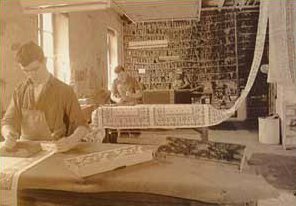 The Véran factory gathered its stock of designs and printing blocks, when other factories had closed. This includes blocks from the famous printer Foulc, in Avignon. When he died in 1916, the Véran manufacture was the last indienne maker in Provence. A chemist, Charles Henri Deméry, fell in love with the factory, and decided to save it. Thanks to Deméry, the factory survived and flourished. His wife, Hélène, was an excellent seamstress, and when a good client, Madame Vachon, suggested in 1947 that she should make a collection of dresses, Hélène started with pleasure. It was a great success. In 1950, an Italian client from Florence decided to open a Souleiado store. Unfortunately, Hélène died in a car crash one year later. Charles was left alone, and continued on the path they traced together. In 1952 there were more than 300 employees through out 4 buildings: the hand printing in the Aiminy mansion, the mechanical printing in St Etienne du Grès, the sewing studios in Avignon (rue Thiers), and the administration in Tarascon. 80% of the items are exported to other countries. Souleiado is sold in Bloomingdale’s and Macy’s in New York City, but Zurich remains the biggest store. Many shops opened. After a stagnant period in the 60’s, Souleiado revived in the 70’s when Chantal Thomass became the collection stylist. She embodied the Souleiado style of the 70’s. After that success, Souleiado started creating more than dresses, and became a luxury brand. When Charles Deméry died in 1986, Souleiado had 2000 point of sales around the world. Unfortunately, Charles’ heirs couldn’t preserve his heritage and the Souleidao brand declined. The Aiminy mansion, was just beautiful museum which showed it’s rich past. 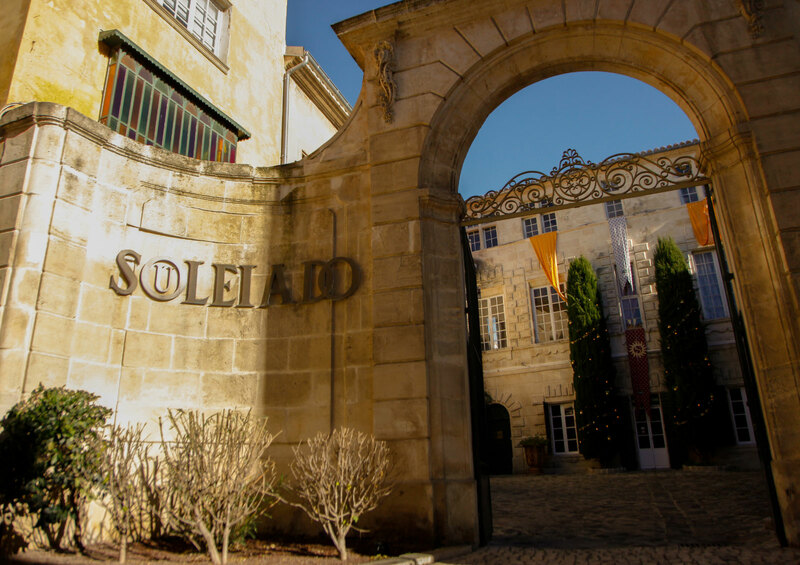 In april 2009, Daniel and Stéphane RICHARD, who were born in Provence, became directors of Souleiado. Their team started digging through the archives of drawings, printing blocks, and fabrics. It was a treasure hunt, the treasure of the Provence indiennes makers, a treasure that was 360 years old! Since then the sun shines through the rainy clouds. The souleiado is back!